Blue Origin's escape system rockets the New Shepard crew capsule away from its West Texas launch pad in October 2012. An in-flight test of this system is scheduled for Oct. 5, 2016. Blue Origin has delayed the highly anticipated "in-flight escape test" of its New Shepard suborbital spaceflight system by one day to Wednesday (Oct. 5), citing bad weather at its West Texas test site. New Shepard consists of a rocket and a capsule, both of which are reusable. 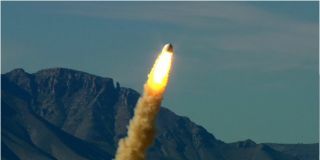 During Wednesday's test, the capsule will fire its onboard escape motor for two seconds shortly after liftoff, jetting hundreds of feet away from the booster. The goal is to prove out the system — which would get astronauts out of harm's way in a real-life launch emergency — during flight.